DALLAS – September 08, 2010 – This year, September’s Latin holiday Fiestas Patrias, has added significance since several Hispanic cultures are celebrating 200 years of independence. In honor of the festivities, Pizza Patrón, the nation’s number one Latin pizza brand, has teamed with Pepsi to roll out a fun twist on the more than 200 year old Mexican game of chance – Lotería. Lotería is similar to Bingo, except it uses images on a deck of cards instead of plain numbers on round balls. The Pizza Patrón promotion features a handout with break off pieces that emulate traditional Lotería cards. The cards can be used for a variety of discounts throughout the month of September, one per visit. “The Lotería is a classic game that brings back very nostalgic memories for many Hispanics in the U.S.,” said Andrew Gamm, brand director for Pizza Patrón. “This is the type of promotion that makes perfect sense for Pizza Patrón because it reinforces our brand’s unique cultural position in the marketplace, and it is fun and accessible for all of our customers of every ethnicity. 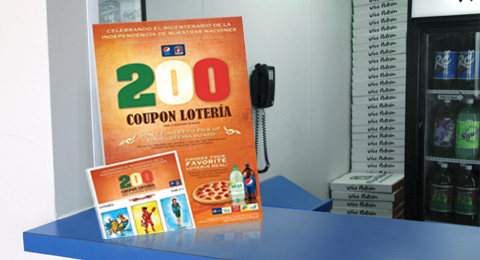 The September Coupon Lotería offerings will be in addition to Pizza Patrón’s famous ultra-competitive pricing and unbeatable every day values like its 12-inch medium AMIGO PIZZAS® starting as low as $4, and its X-Large LISTA-NOW READY™ pepperoni pizzas starting as low as $6 every day.